“By integrating DocuSign’s electronic signing capability with our visitor entry and validation process, we are not only able to enhance the visitor experience, but also reduce the time and burden associated with the paper signature processes. iView Systems and DocuSign, Inc. announce eSignature technology integration into the iPass® Visitor Management Platform. This integration accelerates the check-in process, improves data quality and provides a court-admissible audit trail, verifying proof of presence and compliance with information governance needs. The iPass® Visitor Management Platform is a turnkey paperless solution allowing organizations from simple standalone unattended lobbies to complex global locations to streamline the visitor check-in process. Businesses can collect and easily recall accurate real-time data of current and pending authorized visitors while tracking visitor information to help monitor employee, visitor and facility safety. “DocuSign's eSignature service is the perfect complement to iPass®. iView customers can rapidly and confidently complete waivers or legal requirements with DocuSign’s fast and secure electronic signing service, all from within the iPass® platform,” states Martin Drew, CEO / President, iView Systems. “By integrating DocuSign’s electronic signing capability with our visitor entry and validation process, we are not only able to enhance the visitor experience, but also reduce the time and burden associated with paper signature processes. This provides an easy-to-monitor audit trail, capturing all activities associated with the visit including time and location stamps of where the document was signed,” states Martin Drew. 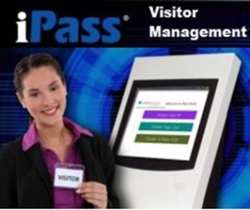 The iPass® Visitor Management System provides a comprehensive solution to register, badge and manage visitors. iPass® delivers a complete standalone visitor management solution or runs as an application within the iTrak® Incident Reporting and Risk Management Platform, taking advantage of existing personnel, subjects and location synergies within the iTrak® system. iView Systems specializes in the development and deployment of a complete integrated and converged physical security information management (PSIM) reporting platform for security, surveillance, and loss prevention environments. iView Systems addresses the needs of multiple industries for a single desktop incident management and reporting system, providing both incident and subject centric approach. iView Systems has rapidly attained industry recognition for its unique solutions and provides incident reporting, dispatch, identification and visitor management platforms and services to the global security marketplace, including the gaming, banking, corporate security and other loss prevention environments. iView Systems is located in Oakville, Ontario, Canada.